Mary and I got up early this morning in despondency to perform the final act of love we could for our Lord Jesus. It took us an hour to get to Joseph’s tomb, the only people about being the Roman guards around the city on night watch. We talked on the way about what to do about the giant stone, there was no way that we could move it ourselves. When we finally reached the tombs the earth moved! The stone in front of the tomb where Jesus was laid then rolled to one side in a blaze of light, and two soldiers who had been posted by the tomb (we hadn’t realised they were going to be there) fell flat on their faces. I’ve never seen a soldier do that, they usually stand so rigid. Something that looked like a man and shining with bright light sat on the stone and talked to Mary and I. He said ‘don’t be afraid’, and told us that Jesus wasn’t there because he had risen! We turned and ran in a mixture of terror and joy when suddenly, walking towards us was Jesus himself! We both fell down in front of him, overjoyed. He told us to tell his brothers that he will see them in Galilee. Then he was gone. Now I have been back to tell the brothers. They don’t believe me yet, but they will, they will. Our Lord is Risen, He is Risen! Alleluia! Jesus, we thank you that with you all our journeys end in resurrection. Thank you for the adventure of knowing you, your suffering and your resurrection. Next Happy Easter! 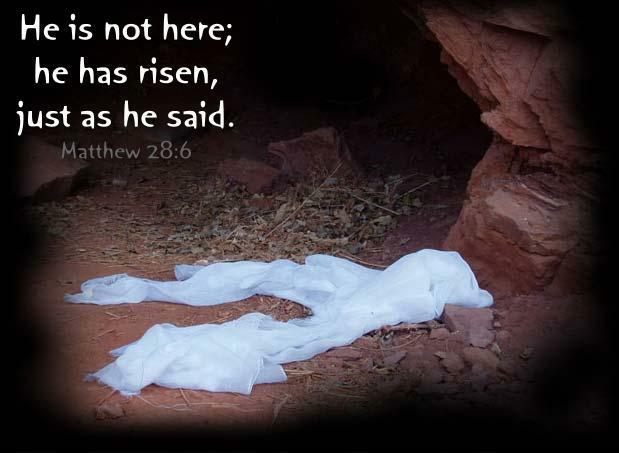 He is risen indeed, alleluia!